The Wabbit’s team blinked when they hopped into the morning light and surrounded the designated target. But the Wabbit looked reticent and he hesitated. Wabsworth was quite aware of the Wabbit’s affection for Big Red Trains and called across. "It’s just an exercise Commander. Stick the sticker!" The Wabbit slapped the blue sticker on the front and looked up. "Is this an award?" said the Big Red Train. "Kind of," said the Wabbit. "But where’s your puzzle magazine?" asked the train. The Wabbit was surprised. "Have we met?" "I took you to Rome twice," said the train. 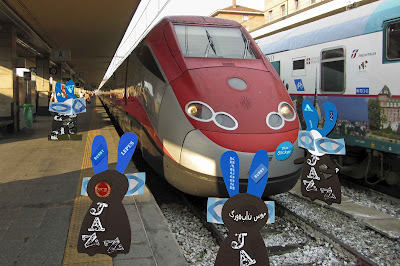 "Sorry, I’m not travelling today," said the Wabbit. "Well, perhaps I can assist you in some other way?" said the train. Lepus winked at Wabsworth. "Does he always speak to trains?" he asked. "All the time," said Wabsworth, "so listen and learn." The Wabbit’s eyes sparkled and he addressed the train with a jovial smile. "There is a way you can help us," he said. "Soon, some red eared wabbits will arrive and I want you to tell them we went the other way." "What way are you going?" said the train. "Whichever way we go, inform the red ears we went in the opposite direction," smiled the Wabbit. "What if they get on the choo-choo to search?" asked Khargoosh. 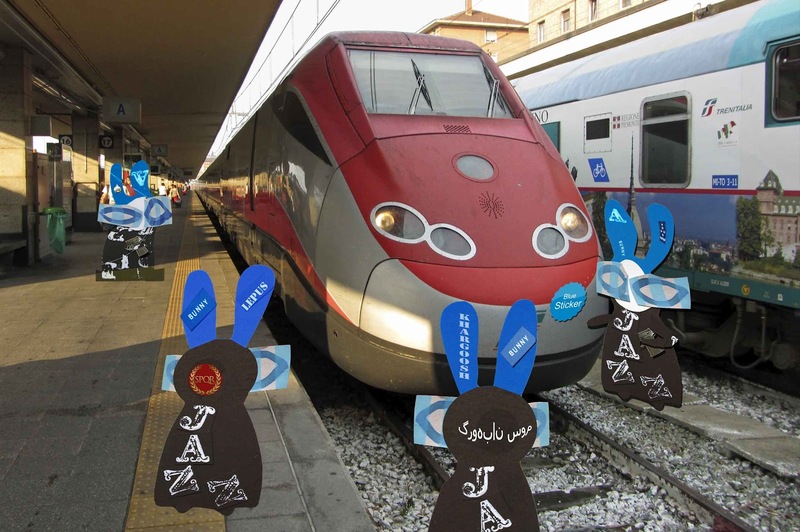 The Wabbit turned back to the train. "Should the red ears board, close the doors and depart immediately." "That’s difficult," said the train, "I’m afraid I’m the 07.35 to Naples." The Wabbit grinned with all of his 28 teeth. "That doesn’t matter," he said, "because the 07.35 is always called the 07.35 - even if it's early." "Or late," said Lepus.